Love Fishing? Try the Best Sport Fishing in Cabo San Lucas! Cabo San Lucas and surrounding areas are host to some of the best Sport Fishing in the World. Cabo Fishing offers an incredible variety of Sport Fish, including Marlin, Dorado, Tuna, Wahoo and more. There is always something biting in Los Cabos, all you need it to find the best cabo fishing charters for your group. Whether you’re an old Pro or a first timer, Los Cabos is a great place to throw a line overboard and hope for the best. With the right Cabo Fishing Charter, Fishing in Cabo can become an addiction. Cabo San Lucas is found at the southern tip of Baja California, where the Pacific ocean meets the Sea of Cortez. The confluence of waters and currents creates a breeding ground for such an incredible variety of species. One of the best places in the world to go Deep Sea Fishing. Although the most popular species to catch down here in Cabo San Lucas are Marlin, Dorado, Tuna and Rooster fish, Los Cabos offers an incredible variety of other species to chase.. Shark, Wahoo, Swordfish and so many more species also frequent the area, making the southern tip of the Baja one of the very best Sport Fishing grounds in the world. Each Species has its season, with a few that can be found year round. The striped Marlin for example are a species that are caught all year and a big draw-card to the area. Often times these creatures are caught closet shore, but the best bet is to hop aboard something that will get you where the fish are. There are so many Cabo Fishing Charters to choose from, depending on the amount of Luxury you are after. Whether you’re looking for a Panga of an 80ft Sport Fishing Machine, we´re sure to have a fishing charter available for you. 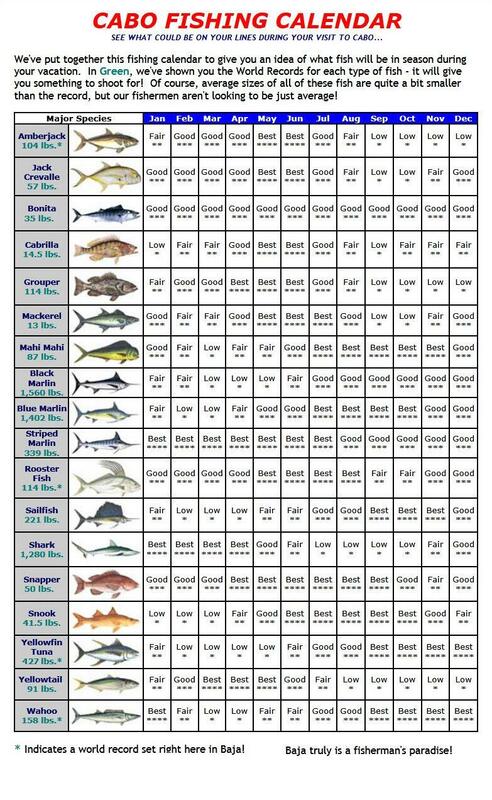 Sport Fishing has become so well known in Cabo San Lucas, that a huge variety of tournaments are held here ever year. Millions of dollars in prize money is up for grabs over the course of several months. The biggest tournament is the Bisbee Black & Blue, where the winning team walks away with in excess of US$1M and the biggest prize pool was in excess of US$5 Million. Not surprisingly, boats and anglers from around come for this amazing event. In the same time period, a variety of other big name tournaments, including the Western Outdoor News Tuna Jackpot, bringing a different style of angler. With big entry fees to allow the big prize money, these tournaments are out of reach for many anglers in Cabo San Lucas. In 2013, a new sport fishing tournament was added to give people who would typically not be involved in these events, the opportunity to try tournament fishing. For the first timers, the Los Cabos Big Game Charter Boat Classic was started. With no entry fee, and $40k in prize money, all you need is a boat. Select from any we have below, or ask about other options. Deep Sea Fishing in Cabo San Lucas is an experience not to be missed. Book your Cabo Fishing Charters Today! Looking for something bigger or smaller? Feel free to Contact Us and we can run you through our selection of 50+ft Yachts or smaller ‘Panga‘ fishing vessels.